Georgetown University’s Hoya Hacks recently hosted a hackathon for social impact as part of the official Major League Hacking (MLH) 2019 season. Two hundred students from around the Washington, D.C, metro area spent 36 hours on campus building solutions on a variety of themes— gender equality, cybersecurity, digital forensics, and social innovation. Amazon Web Services (AWS) and AWS Educate sponsored the event, donating the time of several solutions architects. 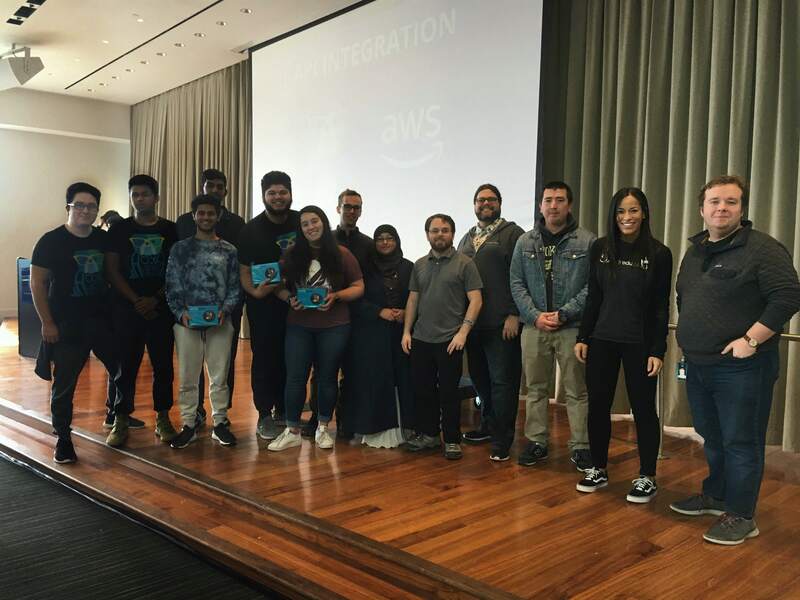 They led a workshop on chatbot integration, provided AWS Promotional Credits for students to build, and showcased technology resources available to students though AWS Educate. Participants also signed up for AWS Educate, which provides an academic gateway for the next generation of IT and cloud professionals. AWS sponsored a challenge encouraging students to build their solutions using an AWS product or service. Fifteen teams built on AWS, with submissions using services like AWS Lambda, Amazon Rekognition, Amazon Simple Notification Service (Amazon SNS), AWS DeepLens, compute and storage solutions, and also Amazon Alexa services to run their submissions. Congrats to the winners of the AWS challenge! fMoods: The winning team’s project was fMoods: Feeling Hungry?, an interactive Alexa skill where food recommendations are provided based on a given mood. Research was conducted on foods that can help boost your mood when you may feel down or depressed. The team took that research and built a skill that will tell you about a restaurant within five miles of your location based on how you may be feeling. The project used Amazon Comprehend and AWS Lambda to make the Alexa Skill. See the Alexa Skill in action here. “The AWS services were extremely user-friendly and easy to understand. This made our lives a lot easier during the hackathon as we had very little experience with it before hand,” said AJ Marra from the winning team. Congrats to AJ Marra and Alex Fantine. No More Shooting: The second place team, No More Shooting, is a platform that can significantly reduce the time it takes for authorities or law enforcement to be informed of a dangerous situation involving a gun. This platform allows existing security cameras to detect guns in real-time. Once a gun is detected, the platform will store and map the location where it was detected, notify law enforcement via a web app, and send an SMS that contains a photo of the suspect to people within the vicinity. Using Amazon SNS, the platform is able to send SMS notifications when a gun is detected. Congrats to Steve Sahayadarlin, Deval Parikh, Alexandro Fuentelzas, and Surya Polina. Peeper Protector: The third place team, Peeper Protector, built a program using Amazon Rekognition that detects when more than one person is seen looking at a computer screen when inputting a password. If detected, Alexa will issue a warning, alerting the user of the potential cyber threat. The team was inspired by common actions where people in today’s society have online accounts for everything and are able to login from anywhere, both private and public. In order to ensure that a password is kept secret and away from prying eyes, this solution would detect and alert users about any potential threat. Congrats to Collin Arnett, Brandon Lan, Manaal Qadri, and Mahdi Saifollahi.